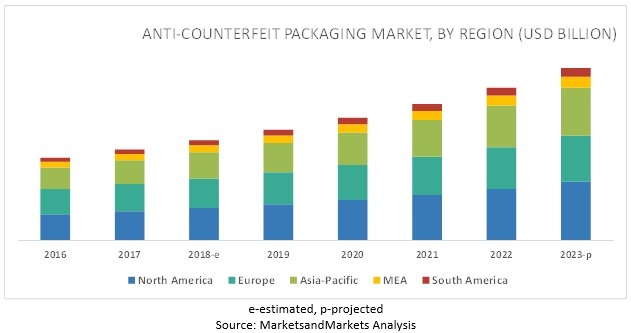 [187 Pages Report] MarketsandMarkets projects that the anti-counterfeit packaging market size will grow from USD 105.9 billion in 2018 to USD 182.2 billion by 2023, at a CAGR of 11.5%. The anti-counterfeit packaging market is projected to witness a high growth due to the increasing focus of manufacturers on brand protection to reduce counterfeiting. In terms of value, the RFID technology segment accounted for the second-largest market share in 2017 and is projected to grow at a highest CAGR during the forecast period. This growth can be attributed to its usage in almost all industries such as automotive, chemical, construction, food & beverages, and pharmaceutical industries. The barcode sector of the technology segment constituted highest share in the anti-counterfeit packaging market; and is projected to grow at a second-highest rate during the forecast period as it is highly preferred for brand protection in almost all industries but especially in personal care & cosmetics products. This is due to the information and code embossed over the barcode does not allow the covert data to be displayed on the label, making it difficult for counterfeiters to copy. A barcode helps companies to integrate product lines and reduce the total cost of ownership. In terms of value, the overt technology of the usage feature segment accounted for the largest market share in 2017 and is also projected to grow at a higher CAGR during the forecast period. Overt is the most widely used technology as they display product information, brand identification symbols, and transportation details during shipping. In 2018, the North American region accounted for a higher share in the total market of anti-counterfeit packaging market, in terms of value, followed by Europe and the Asia Pacific, owing to the increasing focus on developing sustainable brand protection options. However, as the anti-counterfeit packaging market in developed countries is maturing, the markets in China and India are projected to grow at a higher rate from 2018 to 2023. The Asia Pacific region is projected to register the highest growth rate during the forecast period due to the increasing awareness among consumers. This has led consumers to check the product-related information before purchasing products, thereby increasing the demand for anti-counterfeit packaging in this region. High initial capital investments have caused an unfavorable impact on the profitability of the packaging industry. 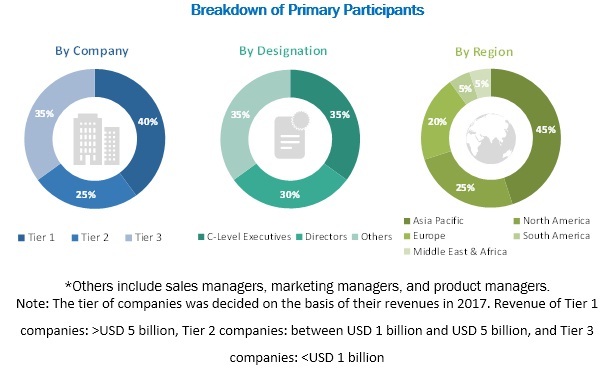 The global brand protection market is dominated by players such as Avery Dennison Corporation (US), CCL Industries Inc. (Canada), 3M Company (US), DuPont (US), AlpVision S.A (Switzerland), Zebra Technologies Corporation (US), SICPA Holding SA (Switzerland), Applied DNA Sciences Inc. (US), SAVI Technology, Inc. (US), and Authentix, Inc. (US). These players adopted various strategies such as new product launches, acquisitions, agreements & partnerships, and expansions to cater to the needs of the brand protection market. In April 2018, Avery Dennison announced a definitive agreement to acquire one of the leading manufacturers of high-quality pressure-sensitive materials, Mactac, LLC’s (US) European business division from Platinum Equity (US). The transaction value of this deal is estimated to be ~USD 227 million. The acquisition will add yearly revenue of ~USD 170 million and 470 employees to Avery Dennison’s current business portfolio. The transaction is aimed at strengthening Avery Dennison’s footprint in Europe and add Macpac’s core product line to the company’s graphics solution portfolio. In November 2017, CCL Industries acquired Worldmark Ltd. (UK), one of the leading suppliers of functional labels for leading designers and brand owners, specifically in the technology sector. Worldmark Ltd. was acquired for USD 252 million. The acquisition gives CCL Industries access to Worldmark’s six manufacturing plants, sales offices, and prototyping design centers. What are the political, social, economic, and technological scenario currently prevailing in different regions and their impact on the demand for anti-counterfeit packaging packaging? What are the major trends evident in the global anti-counterfeit packaging market? Which key developments are projected to have a long-term impact on the anti-counterfeit packaging market? What are the prime strategies of leaders in the anti-counterfeit packaging market? 7.3.1 Shifting Interest of Brand Owners to Recognize Counterfeit Products Will Drive the Covert Feature. 8.2.1 Food & Beverage Accounted for the Highest Market Share in the Anti-Counterfeit Packaging Market. 9.4.2.1 Growing End-Use Industries to Support Anti-Counterfeit Packaging Market in India. 11.8 Applied DNA Sciences Inc. The study involved four major activities for estimating the current market size for the anti-counterfeit packaging market. The primary objective of the study is to define, segment, and project the anti-counterfeit packaging market size on the basis of technology, usage feature, end-use sector, and regions. The study also aims at strategically analyzing micromarkets with respect to individual growth trends, future prospects, and their contribution to the total market. It also provides detailed information about key factors influencing the growth of the market (drivers, restraints, opportunities, and industry-specific challenges). In addition, the study analyzes competitive developments such as agreements, contract, collaborations, expansions, and new product launches. In the secondary research process, various secondary sources such as Hoovers, Bloomberg BusinessWeek, and Dun & Bradstreet were referred to, so as to identify and collect information for this study. These secondary sources included annual reports, press releases & investor presentations of companies, white papers, certified publications, articles by recognized authors, gold standard & silver standard websites, regulatory bodies, trade directories, and databases. After arriving at the overall market size from the estimation process explained above, the total market has been split into several segments and subsegments. In order to complete the overall market engineering process and arrive at the exact statistics for all segments and subsegments, the data triangulation and market breakdown procedures were employed, wherever applicable. The data was triangulated by studying various factors and trends from both, the demand and supply sides. To define, segment, and project the global anti-counterfeit packaging market on the basis of technology, usage feature, end-user industry, and region. This research report categorizes the anti-counterfeit packaging market based on technology, usage feature, end-use sector, and region.